It’s still summer and the maxi dress is a great choice for summer parties, relaxed afternoons and festivals. The maxi dress is a floor length dress suitable for day times and outdoor events, and generally associated with the carefree, hippyish look of the 1970s. If you sew it is an opportunity to use a fairly big pattern or colour combination that might feel too much for a top. I know what she means! I think if you choose a white, pastel, ditsy print or lace maxi you may be in danger of looking like you just got out of bed and popped down to the park. Actually the fear of being un(der)dressed is a more general one – have a look at this post on how to avoid it in general. My first thought would be if it looks remotely like nightwear then you have to work harder with the accessories – the hat and sunglasses look, or the cardigan/bag/platform shoes. You might also consider a belt, a casual jacket, or interesting jewellry. But if you always go to bed in tiara, just wear that! The other thing I would emphasise is the importance of underwear – a bra with sufficient support – otherwise it will look like you are ready to dive back under the duvet. Also I would line a summer maxi, or at least chose a non-translucent fabric that won’t reveal all if you stand with your back to the sun. What sort of styles should we look for when buying or making a maxi dress? The most important thing, in my view, is to work with your overall silhouette as a maxi dress will emphasise it. If you are curved then ensure you have the bust and waist emphasis, with a fuller skirt. If your figure is straight with slimmer hips and not much waist, then look for more of a column shape with a narrower skirt. Ensure the skirt is long enough to nearly touch the ground. You can wear high heels if you like, but I prefer sandals with a maxi dress (in line with the relaxed, summer feel). The funny, heavy black platforms in the middle picture (below) are not great. Maxi dresses are often designed with an empire or higher-than-natural-waist line. This has the effect of lengthening the legs and works well on women who are longer in the torso than the leg. The all over colour/fabric of a maxi has the same effect, so generally it is a nice look for shorter women too. If you are not ultra-thin, then the maxi can be your friend. The single colour/print draws the eye immediately to the vertical. Here are a few examples. The scale of the dress and the patterns will tend to make a larger lady look smaller. What shape would look good on Ruth with her semi-straight body? 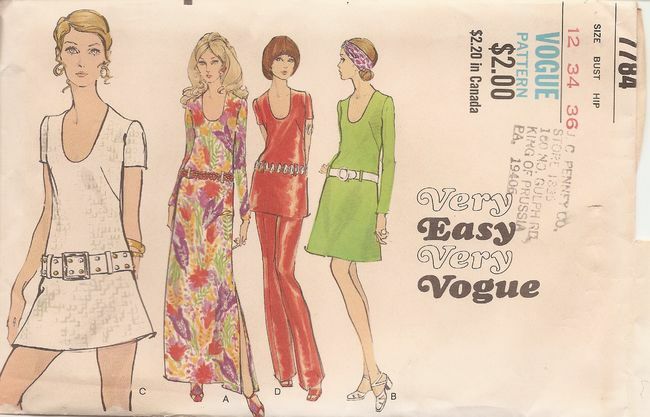 Well I am not a pattern whisper but I would go for a style like this 1970s dress. I would choose a soft to medium weight woven fabric, rather than a jersey. The dress has some structure and the shape will flatter a semi straight body. The nice long darts elongate the body as does the U shaped neckline. I think the belt at high hip will elongate Ruth’s upper body in a pleasing way. It is also such a useful pattern as it works well as a dress at several different lengths. The mini length could be worn over matching (to get the maxi dress/jump suit look) trousers if you prefer not to show your legs. I find choosing footwear for maxis rather challenging. I have a new rtw maxi, in striped jersey, navy, like it, but haven’t worn it because of the shoe issue. I’d like to wear with flattish navy (and comfy) sandals but don’t have any and search has been unfruitful. I will wear, though, when I go to London for a few days later in the month – probably more suitable there! I haven’t made one and have no plans to do so. I have to admit that the maxi is one look that has never appealed to me. In the 1990s I had a couple of dresses that were closer to the column that you describe, even though they were made of floaty material, but they were never my favourites. I guess the bohemian look doesn’t do it for me. That said, it does look comfortable, especially in the fuller, floatier fabrics and your advice seems sound. A beautiful fabric/pattern/colour could make the dress. This is a trend I’m going to skip…but then I don’t wear short dresses either. I love that striped one at the top. I haven’t worn my new maxi yet, but I do enjoy wearing a comfortable maxi skirt around the house. I’m a long time pant-wearer, but I’m finding skirts way more comfortable now. It’s just a matter of getting used to the look, and maybe also to a more graceful posture? You can’t go stumping around in a maxi! Bed sheets. Nighties. I always worry about tripping up. Maxi dresses by themselves already look overwhelming, so women should be careful and wear minimal accessories. Petite women should carry small clutches or purses, as overly large hobo bags can overpower their frames.